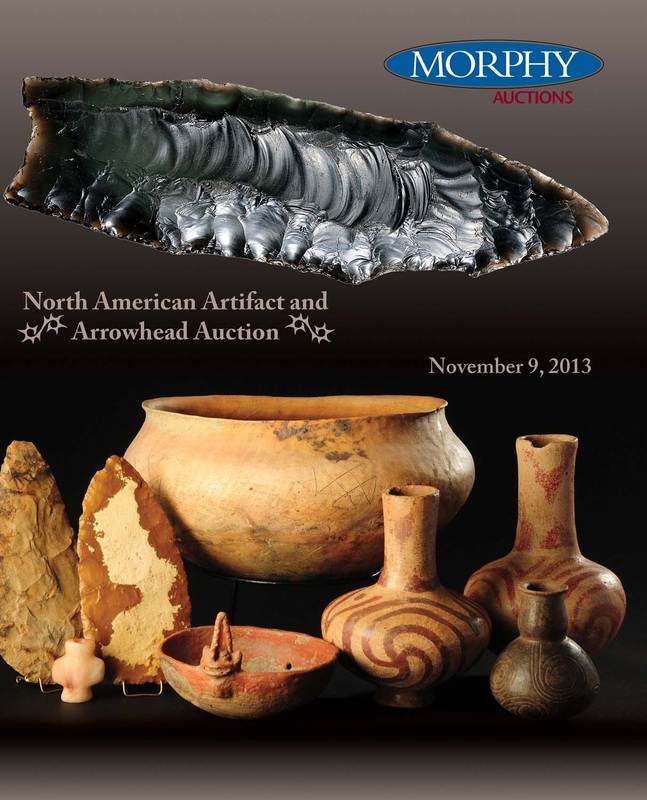 Integrity is the theme for Dan Morphy’s first prehistoric American artifact auction. Recognizing a need in the market for a better authentication process, Dan has enlisted John Mark Clark to head the prehistoric artifact division. Clark, a 50 year veteran of the prehistoric American artifact collecting community, has gathered what he considers the most experienced and knowledgeable people in the prehistoric field to compose the Morphy authentication team. Several Scientific labs will be incorporated into the authentication process for further buyer assurance. Highlighting the auction is the Rutz Clovis. At 9 3/4” long, this sea green obsidian masterpiece is the largest Clovis point on record. Consigned by the family of the original finder, the importance of such a monumental artifact could easily cause it to exceed it’s $200,000-400,000.00 estimate. Other Paleo items in the auction include an exquisite Middle Tennessee Cumberland point, a large red jasper Clovis, and a fantastic Paleo biface / blade made of rare Niobrara flint. This auction will also offer what is believed to be the largest, and undoubtedly, the finest cache of Archaic Motley points yet discovered. These large points all range from 4 to 6” and are covered with calcined patina on the bottom side. Other Archaic era offerings include several beautiful Dovetails, Daltons and Snyders points. A very large old time collection of nice Archaic Texas points will be offered in this auction. Several Archaic Bannerstones are included in the auction, the highlight being a ferruginous quartz Tennessee style Bottle banner found near Nashville. One of the finest hardstone raised groove axes ever found in Tennessee will be in this auction. The Woodland era is well represented in this auction with a unique cache of Southern Tennessee Copena points. “Outrageous” best describes the colorful amalgam of Beech Creek and Horse creek cherts selected by the ancient craftsman to make these. The two smaller blades are considered the finest of their type. Other Woodland offerings include two rare Jack’s Reef points and two Point peninsular culture Celts. Mississippian culture offerings include a Human “rattlehead” bowl, a rare Human Foot effigy jar, 2 Nodena swirl red-on-buff painted jars, a Dover ceremonial blade, and several high status Greenstone ceremonial objects from the Dallas culture of S.E. Tennessee. An outstanding offering of Caddo culture artifacts is highlighted by a number of finely engraved pots, jars and bottles, several of which, are unique forms. A solid Caddo pipe will be on offer, along with a superb collection of Hayes points. This auction will offer some of the highest quality prehistoric artifacts ever offered at auction, which have been vetted by the most knowledgeable and experienced minds in the field. Quality, knowledge, experience, and the Morphy reputation for honesty all combine to offer the collector a worry free buying environment.